The CIAO Data Model allows powerful filtering of datafiles beyond the standard onboard event filtering. A file may be filtered on any of its columns, e.g. energy, time, position. Complete syntax descriptions and further examples of filtering data are available from "ahelp dmfiltering". Last Update: 4 Jan 2017 - Review for CIAO 4.9. Removed all opt=all from dmcopy commands due to the dmcopy bug. Filtering is not restricted to the level=2 event file; in fact, filters are usually applied to the evt1.fits file when working with grating data. For most ACIS analyses, you will want to include at most the 0.3 kev to 10.0 kev energy range, as explained in the Choosing an Energy Filter why topic. This command creates a new event file that only includes the data within the specified energy range. This filter only keeps the back-illuminated chips (ccd_id=5,7). 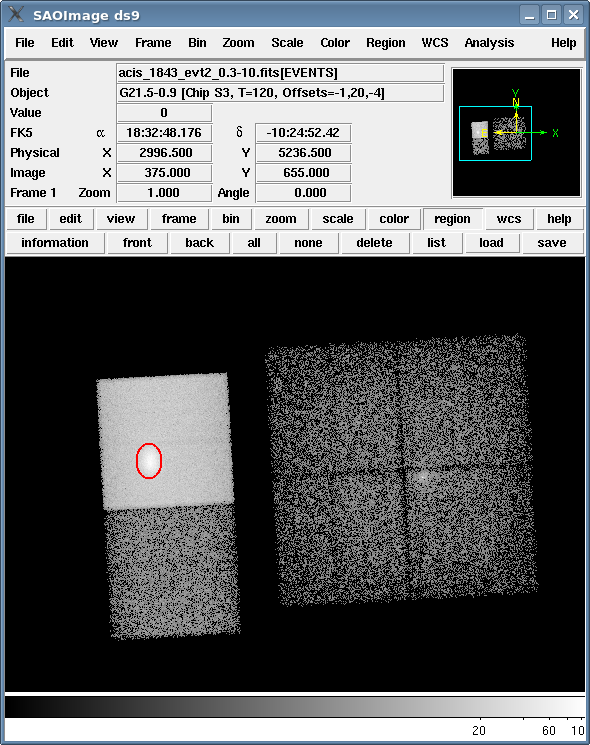 For more involved filters, use the CIAO tool dmgti. This tool allows the user to set constraints on the other (i.e. non-TIME) columns in the file and extract the set of times for which those constraints are true. A general outline of this process is given first, followed by a common filtering scenario in detail (Eliminate High Background Times). Determine a filtering criterion that can be expressed as a valid dmgti userlimit parameter. unix% pset dmgti userlimit="<filtering criterion>"
Here is one example of how to eliminate periods of high background. The ACIS background and Filtering lightcurves threads also discuss ways of filtering out flares. A log scale (Scale → log) and some adjustment to the color table show the object and the background. It may also be necessary to adjust the blocking factor to view the whole image at once; try "Bin → block 8" for a reasonable view. From this image, regions may be created to define the background area. In this example, the background will be defined as the entired dataset minus the selected source region. Select "Region → Shape → Ellipse" from the ds9 toolbar, then hold down the left mouse button at the center of the field, and drag until the ellipse covers the desired area. Clicking on the resulting shape will select the region, allowing you to reposition or resize it. This region (Figure 1) is used for the example. This source region will be excluded from the data in order to create a background lightcurve. Region → Save Regions... → Save As "obj.reg". You can check the resulting parameter file with plist dmextract. Here the shorthand "sky" was used to specify x,y coordinates. Since "sky" is an alias of "(x,y)", both work in this context. The plot is shown in Figure 2. The spike occurs in the lightcurve between 84274232 and 84274267. To remove this feature from the dataset, we need to define a filter that excludes rates greater than ~80.0 counts/sec. A more complex filter could be applied instead, such as "count_rate>= 5.5&&count_rate<=80.0"; see ahelp dmfiltering for other examples of filtering syntax. You can check the resulting parameter file with plist dmgti. The result of this thread is the level=2 event file acis_1843_evt2_0.3-10_bkgflt.fits, which is filtered for high background and restricted to a specific energy range. 03 Dec 2012 Review for CIAO 4.5; removed white space in dmgti expressions which might get interpreted as stack seperators. 04 Jan 2017 Review for CIAO 4.9. Removed all opt=all from dmcopy commands due to the dmcopy bug.